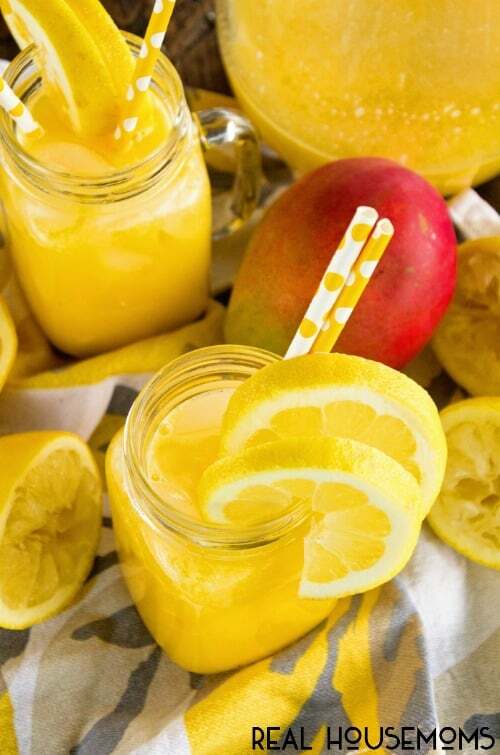 Skinny Mango Lemonade is a quick, refreshing beverage recipe that will sweeten up any summer day without leaving you feel guilty! How do you spend your summers? Staying inside because it’s way to hot to enjoy the nice long days? Maybe you head to the beach to keep cool? Or you could hang out in the back yard laying in your hammock. Whatever you choose to do I’m sure it’s perfect. I, for the record, choose to spend as many days as I can at our lake cabin. I unplug from the hustle and bustle of real life easier there. Mainly because there is not internet and I’m to cheap to get it installed or up my data plan on my phone. Secretly it could just be that I enjoy not having to deal with social media, blog posts, planning, executing all of that stuff. It’s the only time I truly can spend time with my family and not be totally distracted. It’s the world we live in isn’t it though? My days at the lake often include a delicious beverage to cool off with. 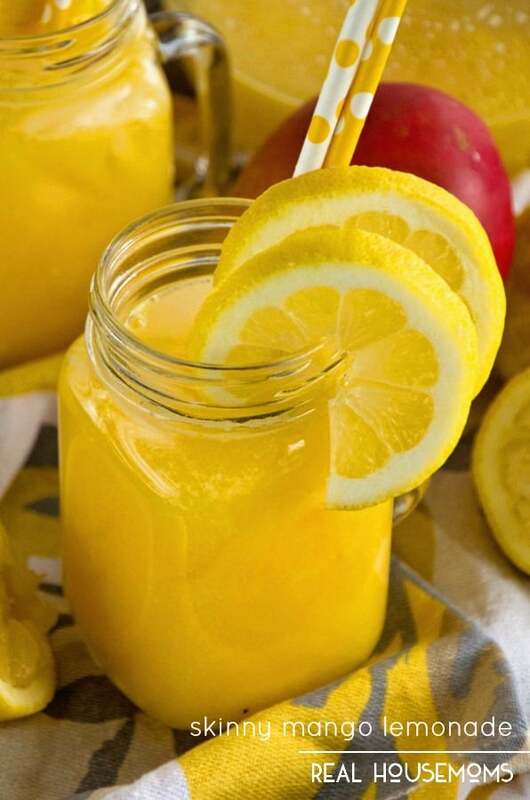 There’s something about lemonade that screams summer to me. I grew up on good old Country Time Lemonade out of the canister and never knew the true beauty of fresh lemonade until now and there’s no going back for me! Plus I never realized how easy it is to make. Totally worth the little extra effort that it requires because it’s that much better! 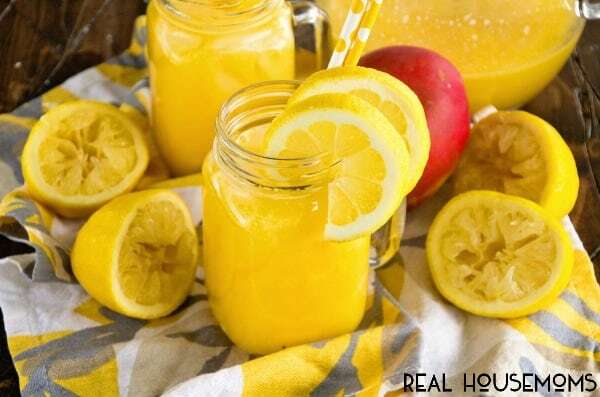 This recipe is a quick and easy lemonade that is lightened up by using Truvia and spiked with mango for a fruity twist on it. Feel free to serve it up to the entire family. They are sure to enjoy it! If you need me I’ll be relaxing in my hammock for the rest of the summer with a big glass of Skinny Mango Lemonade! 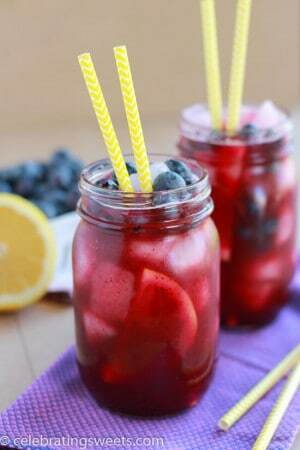 Get more great recipes like this one on our Real Housemoms Drink pin board! Follow Real Housemoms’s board RH | Cheers! on Pinterest. Blend mango, Truvia, and 1 c. water on medium high 1 minute or until mangoes are completely pureed. If you prefer no pulp strain mixture through fine mesh sieve. Combine puree and remaining ingredients. Stir well, chill. Serve over ice. 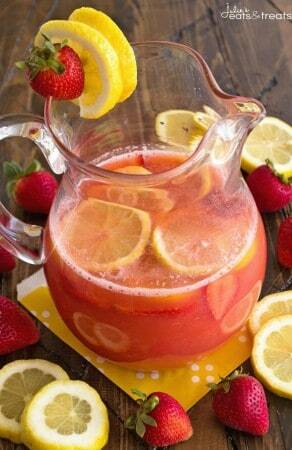 Check out these other Lemonade Recipes on Julie’s Eats & Treats! Skinny Spiked Strawberry Lemonade ~ Delicious Strawberry Lemonade Recipe Sweetened with Truvia and Spiked with Strawberry Lemonade Vodka! My goal is to provide you with simple, easy, and family-friendly options. Recipes need to work with your life, so while you are running around after your kids and cleaning boogers off your clothes you can still make homemade meals. Trust me. I've been there and often times still am!